So, the question is why Track Events Goals in Google Analytics? 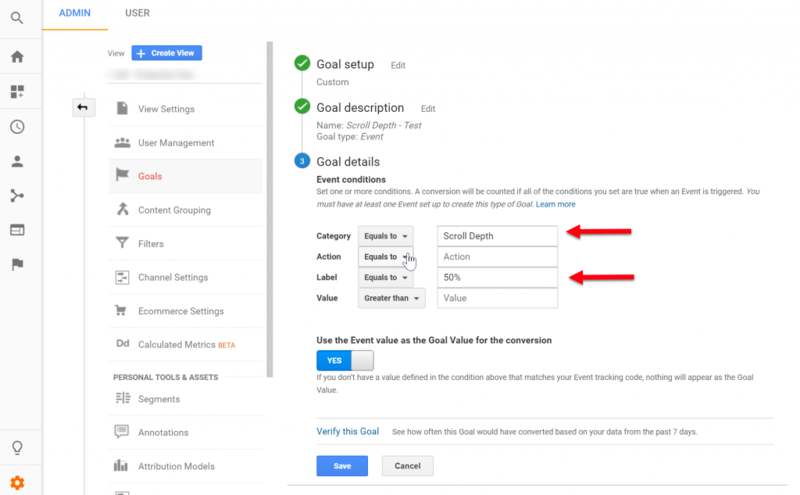 For one thing, Tracking Event Goals in Google Analytics gives you insights that are valuable and specific to your business. Furthermore, Events that align with your key business objective are crucial to understanding how users from various sources paid and organic are interacting with your website and moving towards a final conversion. To clarify, not all KPIs (Key Performance Indicators) translate as a primary conversion. However, each primary conversion has a series of steps (read KPI) that a user takes to get there. As a result, this series of steps is where we can extract valuable data. 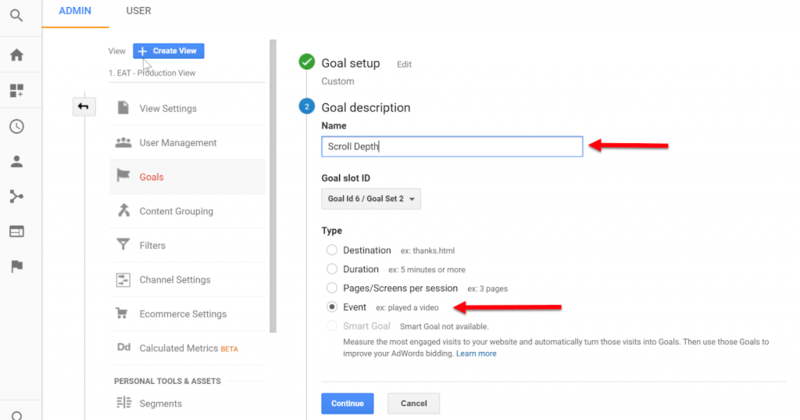 So what events should we be tracking as goals in Google Analytics? In this blog, I will be going over creating goals using Events for our soft conversions and URLs for our primary conversion. 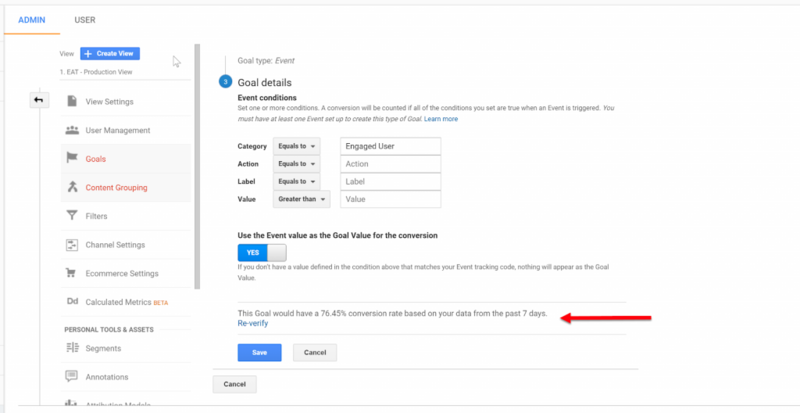 Note: This use case is to give you an introduction to what is possible with Event Goals in Google Analytics but by no means is a steadfast rule to follow. 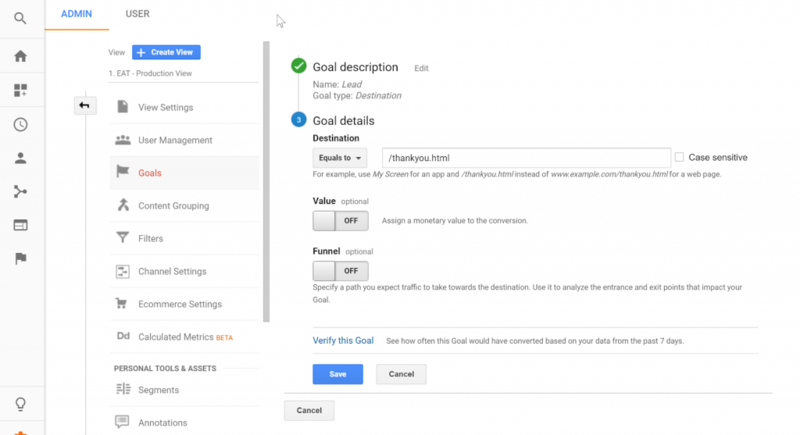 WTF is the difference between Google Analytics Goals vs Events? First, Events are not tied to any specific pages and can occur at multiple time per session. In addition, Events do not allow you to see conversion data such as conversion rate. Also, you cannot access Events in standard reports under Goals and Conversions. To access Event insights you can reference the Behavior report in Google Analytics. Furthermore, Goals are accessible for Standard Google Analytics reports including any attribution reports. However, unlike Events Goals are tracked only once per session. 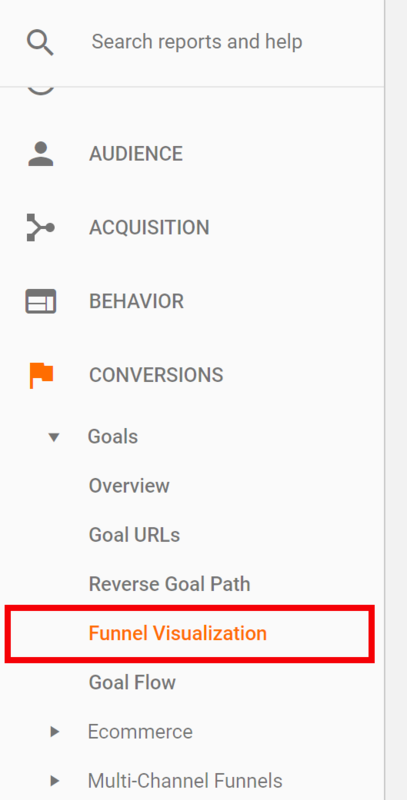 You can find Goals under conversions in Google Analytics. Now that we have the differences clarified let’s move on to setting up Event Goals in Google Analytics. To begin, let’s get started with setting up the engaged user event. 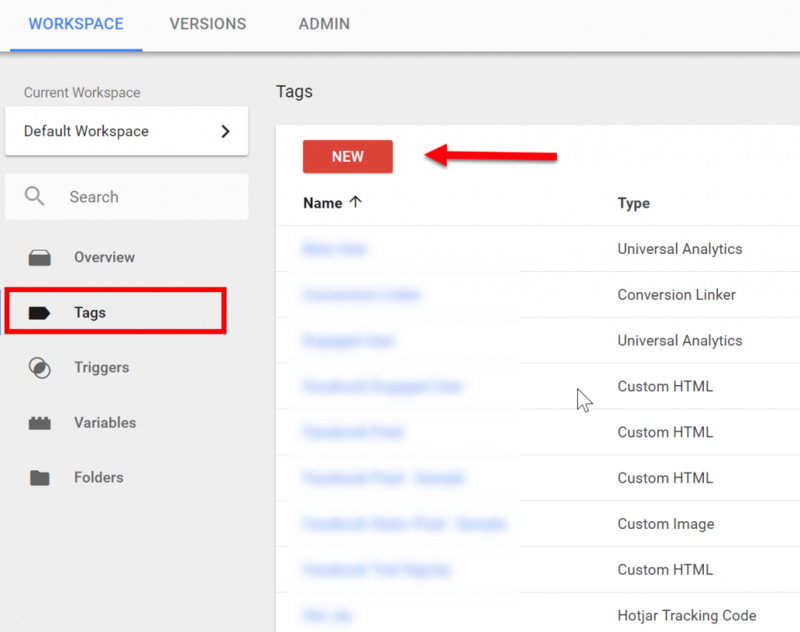 Give the Tag a name then Under Tag Configuration select Universal Analytics as the Tag Type. 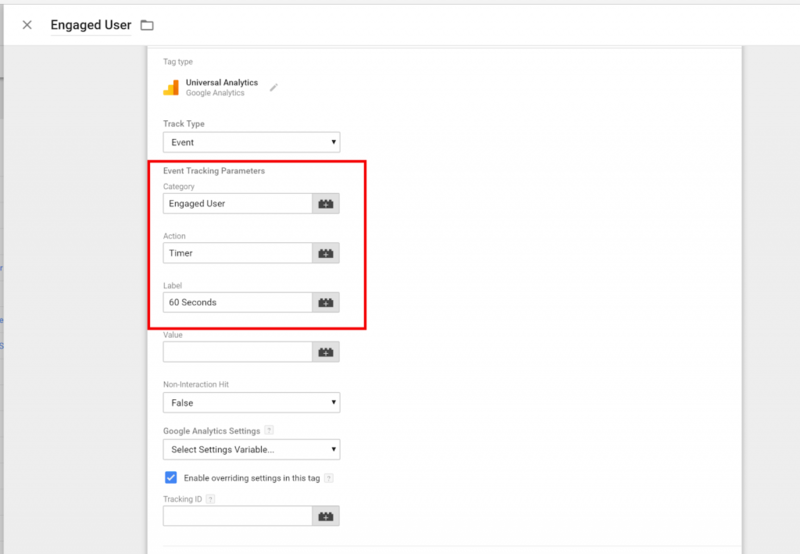 Next, select the Enable overriding settings in the tag checkbox and insert your Google Analytics Account ID manually or from a constant variable. Next, let’s move on to set up the trigger for this event. 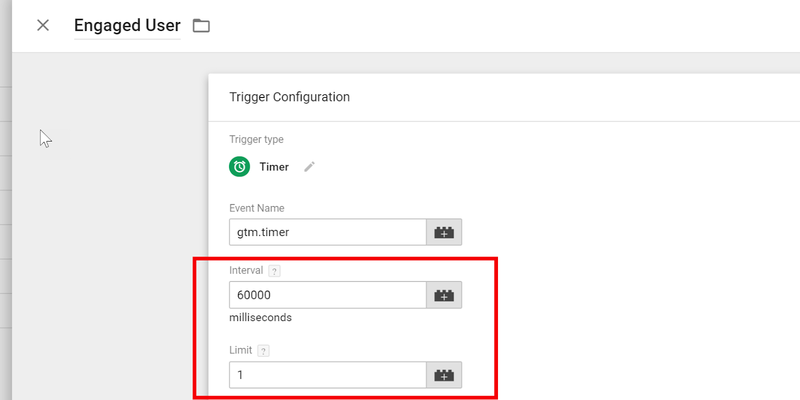 Rename it Engaged User and under Trigger Configuration Chose the trigger type called Timer. Now, configure the trigger to fire after 60 seconds. To do this enter the time interval in milliseconds. Next, set the interval to 1. Usually, you only want the timer to fire once for each session. Click Save for the trigger and then again click save for your Tag. To verify if the tag is setup correctly enable preview. and open your website in the same browser instance as GTM. If all is working correctly, you should see your timer trigger fire in the preview pane after 60 seconds. 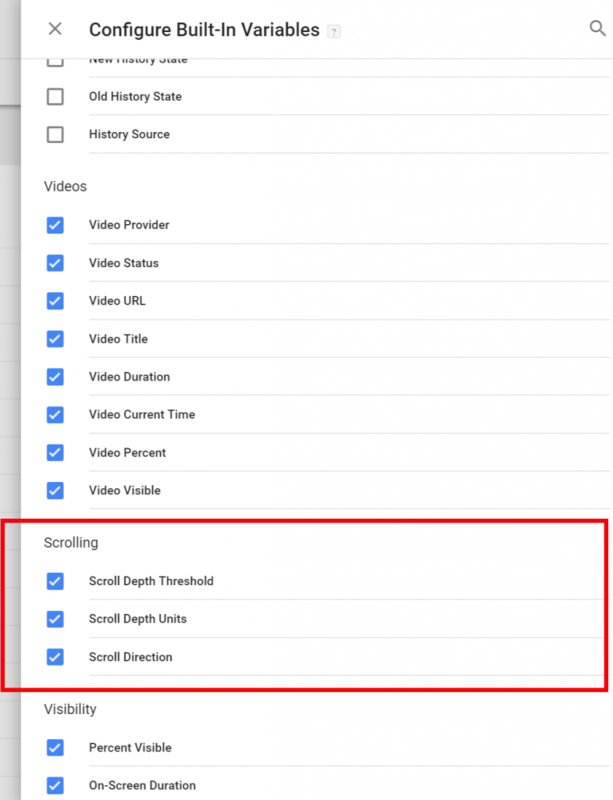 For scroll depth, I like to track an event for the 25%, 50%, 75% and 100% scroll thresholds. I can then use this to understand how users consume content in an event flow on a landing page. I can also take the most valuable one, i.e., 75% and turn it into a goal for goal reporting and tracking. 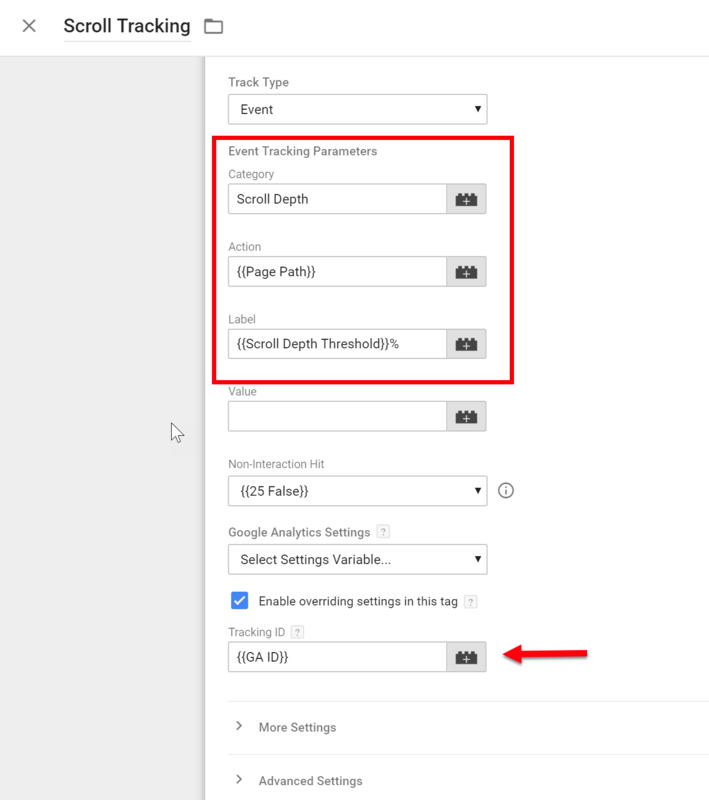 In the past to achieve this, I would have to use custom code and integration, but GTM recently added the scroll depth variables making it easy to track each one of these events without a custom configuration. First, let us make sure that you have the correct Built-In Variable configured. 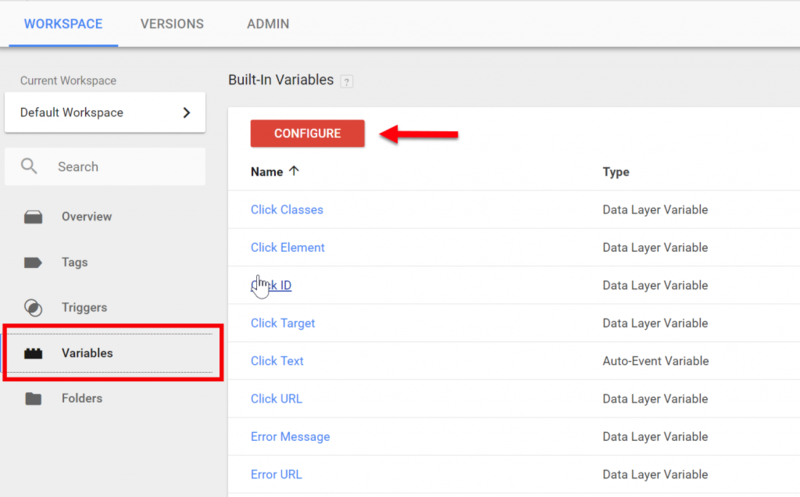 Go to Variables and click Configure. Make sure the Scrolling Variables are selected. Now let’s go back to tags and create a new Universal Analytics tag. Under Event Tracking Parameters we will add the following values. Next, let’s add the appropriate trigger. Add 25, 50, 75 100 to the percentages field. This means we will capture an event at each one of these percentage thresholds. You can choose to track all pages or only specific ones depending on your requirements. Save the trigger and save the tag. Note: Since the scroll tracker fires an event (interaction) for each threshold users with minimal scroll i.e., 25% can skew your bounce rate. Hat Tip to Simo Ahava who breaks down The Scroll Depth Trigger and calls this out. Ok now that we have engaged user events and scroll depth events firing in GA lets take a look at setting up Goals for these events. Give the Goal a Name and Choose Event then click Continue. 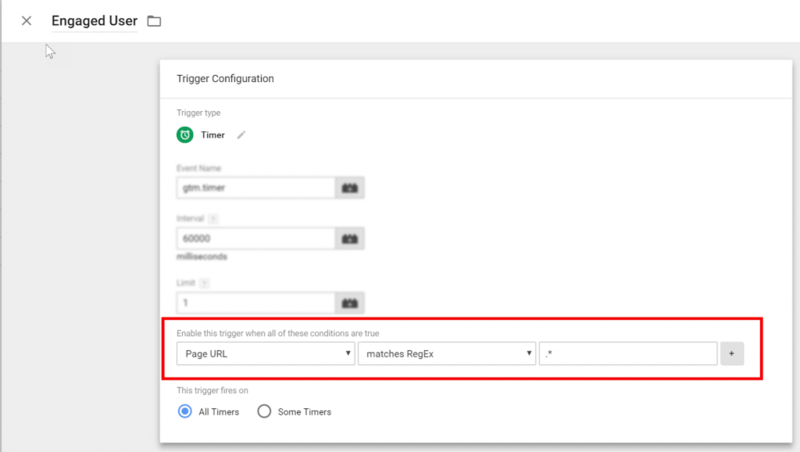 Enter the value for the Category as Engaged User exactly matching the same value that you entered for the Event Category in the Google Tag Manager. If you can measure an average value for each engaged user enter that or if you are capturing a static or dynamic value in the Event Value field you can refer to that value. You can verify the validity of the defined goal for the past seven days of data. Ok so for scroll depth we are tracking four events. However, turning each scroll threshold into a goal might not make a lot of sense unless you have a specific reason to do so.I.e., measuring each scroll threshold as steps in a landing page funnel. In this case, let’s say that any user scrolling 50% or more of a blog page is considered a valuable and engaged user with whom the content is resonating. 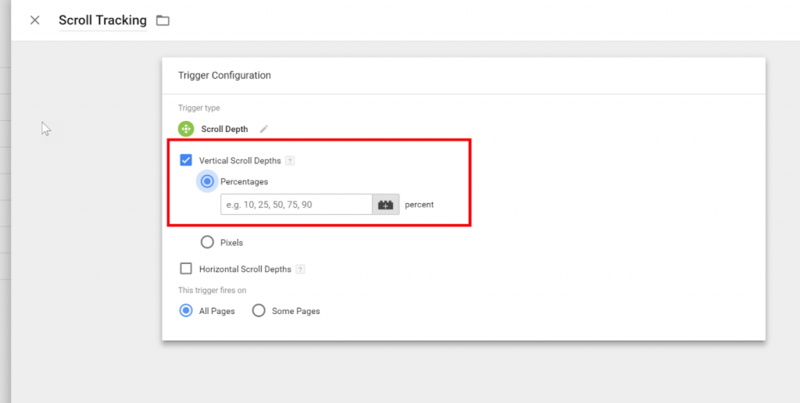 As a result, we will want to capture all scroll depth higher than 50% as a goal. So to do this navigate to goals in the admin settings and click create new. Give the Goal a Name and select Event. Now for the Label enter 50% so that we capture all users scrolling at least halfway down the page. When we define the label this way we are capturing all users that are scrolling past the 50% threshold. Note: Sometimes seeing events in Google Analytics can be useful to verify that they are actively working. Real-Time > Events report – This is great to see events firing in real time. Behavior > Events > Top Events – If you want to see historical event data. Keep in mind that there can be a lag before recent events show in this report. In order to set this up, we could Technically use GTM and leverage Event Goals in Google Analytics. 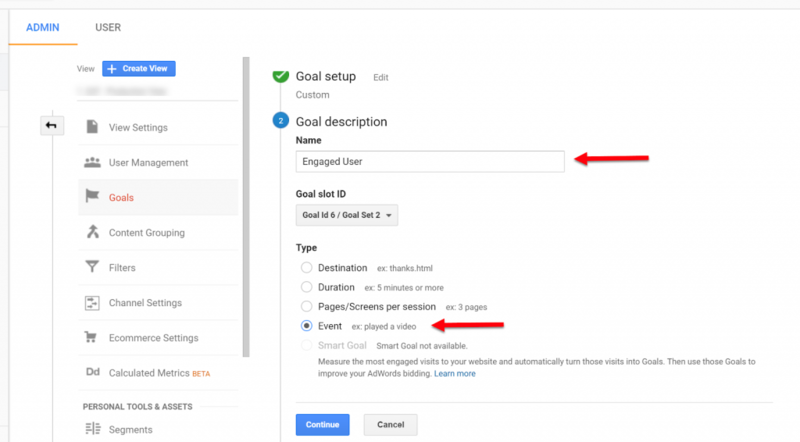 However, I wanted to provide an example of setting up goals directly in Google Analytics using URLs. To begin, go to goals under admin settings and click New Goal. Give the Goal a name and select destination. You can assign a monetary value to each lead and also enable funnels based on pages visited. Funnels can be useful since it activates the visual funnel in Google Analytics under conversions. The data-driven nature of the web has given us the ability to track many actions and use these to improve our campaigns. 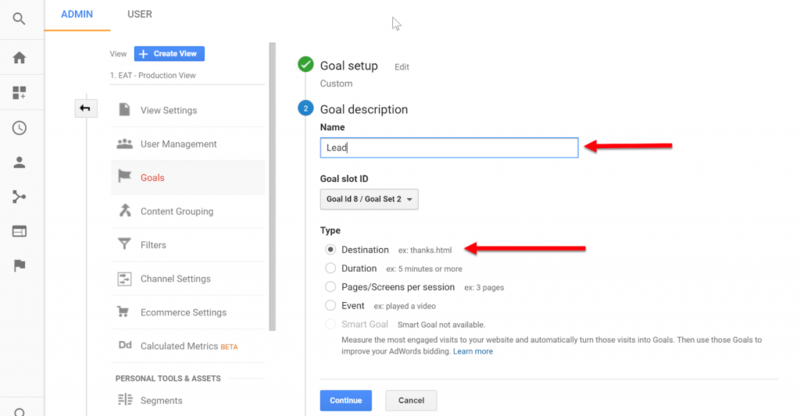 Although relatively simple to set up Event Goals in Google Analytics are often overlooked. So, how have you used events and goals to track the progress of your business? Tell us in the comments! This is seriously badass. Thanks for writing it. Researching it. Making it easier for us marketers to do our jobs.